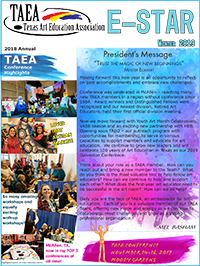 The Texas Art Education Association publishes the newsletter, TAEA Star, four times a year: Fall, Spring, Summer, Winter. Letters, articles, and comments are welcome. Please include your name, address, phone number, and email address on all correspondence for certification purposes. The purpose of the Star is to educate and communicate the association's activities to its membership. The viewpoints contained in the Star represent those of the writers and not the Texas Art Education Association. The Star reserves the right to refuse any copy based on questions regarding copyright, ethics and/or inaccuracy. The editor reserves the right to edit copy for length without loss of integrity to submitted copy. Ad must be prepaid to TAEA.